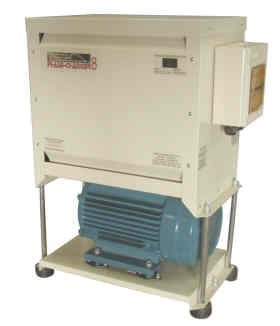 In all rotary converters switched power capacitors are used to create an offset phase (needed to start the pilot motor), to balance the phase to phase voltages, and to improve power factor (if fitted). Almost all converter manufacturers worldwide use contactors, which are effectively large relays with mechanical contacts to turn capacitors on and off. Capactiors store large amounts of electrical energy and need to be switched on regular intervals in and out of the converter’s AC power circuit to maintaing the best voltage balance under varying loads. As AC is alternating at 50 cycles per second and a contactor is a mechanical device with physical contacts that will randomly turn on at any part of the sine wave, arching WILL occur accross the contacts and the life of the contactor will be dramatically shortened. While there are special contactors designed to limit the arching when switching capacitors, the timing of switching into the cycle is still random, plus these contactors are expensive. 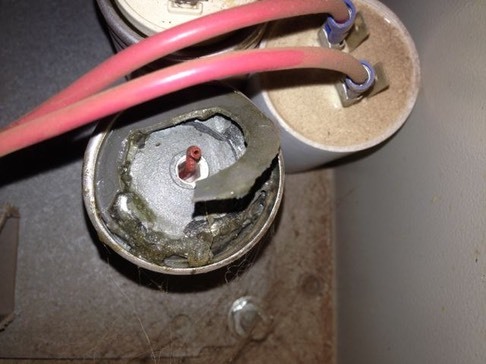 But there is more to it than simply arching contacts: Charged capacitors when switched into AC power circuits at the wrong time will suffer damage and will have shortened life spans. In addition, contactor switching is SLOW when compared to electronic switching as we do in all our Phase Changers, and this will limit the functionality of the converter particularly with varying 3 phase connected loads. It is not possible to have a hard start feature, as the Phase Changer does, when contactors are used to switch capacitors as the capacitor bank is too large and the time of operation is usually very short - often less than one second. The following two picures show what can happen to capacitors and contactors when mechanical contactor based switching is used in converters. 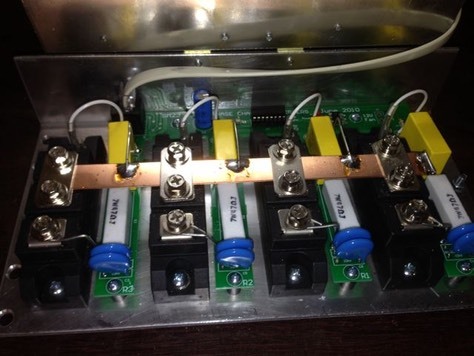 This is from a competitors converter we replaced with a Phase Changer. 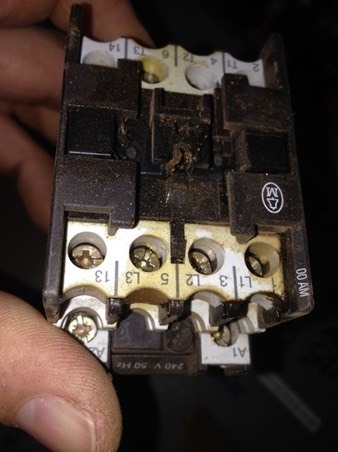 It had become a constantly on-going and expensive problem for the customer who had his local electrician replacing blown parts on a very regular basis. The Phase Changer series of converters does not use mechanical contactors to switch capacitors. 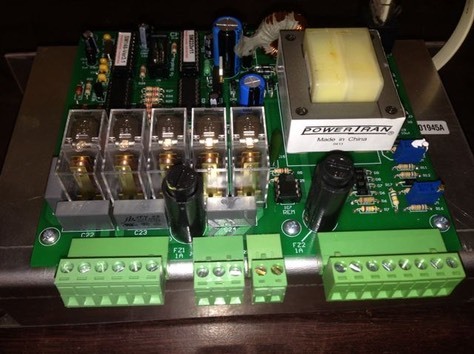 We use our own purpose designed and built controller to switch capacitors electronically. Not only does electronic switching allow us to accurately switch capacitors at the correct part of the AC cycle, it also allows us to switch them in many combinations, extremely quickly, so the Phase Changer reacts instantly to changing load conditions, including bringing in the large ’start’ capacitor bank when the hard start feature is required. This is the standard Phase Changer controller, which utilizes two micro controllers with complex (and protected) programs, and remains fully servicable well into the future.